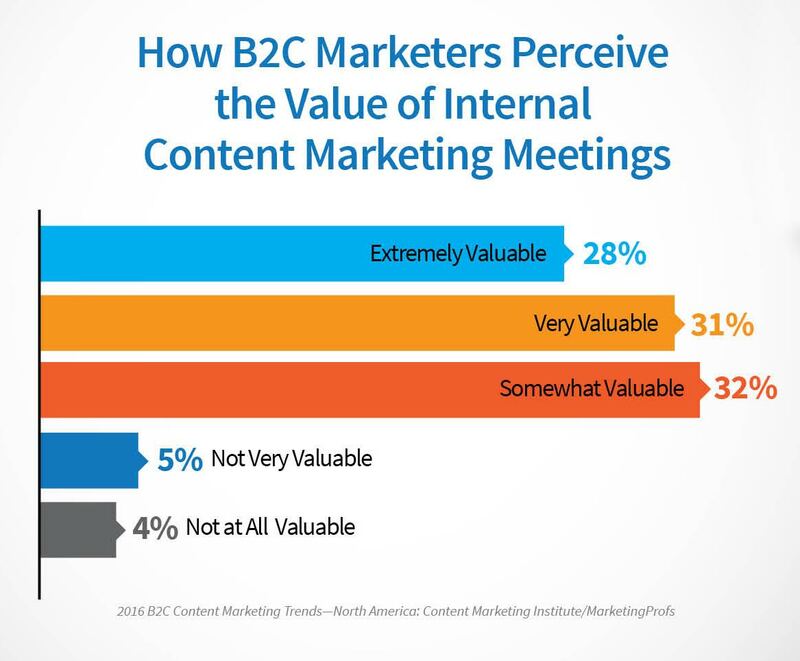 B2C marketers meet more frequently to discuss their content marketing and find more value in those meetings than their B2B peers. 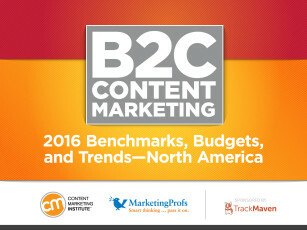 These findings and more come from the Content Marketing Institute/MarketingProfs sixth-annual content marketing survey, B2C Content Marketing 2016: Benchmarks, Budgets, and Trends – North America, sponsored by TrackMaven. The 2016 B2B survey results were released two weeks ago. 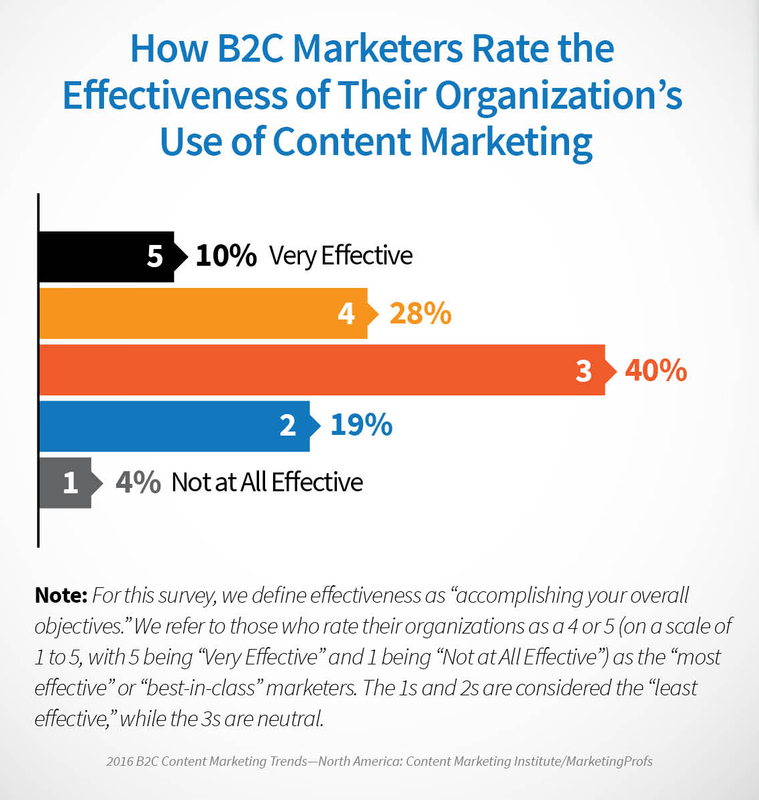 We offer a few highlights of the 2016 B2C content marketing survey and encourage you to read the full-length report for the comprehensive results. 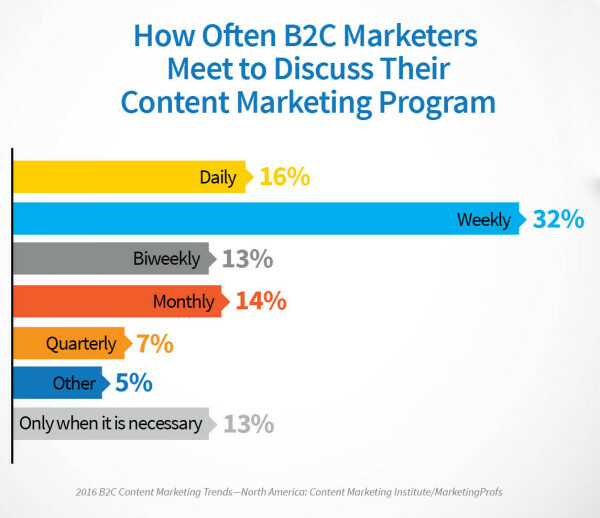 This year, we asked marketers how often they meet with their teams – in person or virtually – to discuss the progress/results of their content marketing programs: 48% said they meet daily or weekly (vs. 44% of B2B marketers). B2C marketers are more likely than their B2B counterparts to say that their content marketing meetings are valuable (59% vs. 54%). The biggest difference is that 28% of B2C marketers say the meetings are “extremely valuable” compared with only 19% of their B2B peers. Get tips on making your marketing team meetings more productive in our B2C Research Roundtable on the topic. 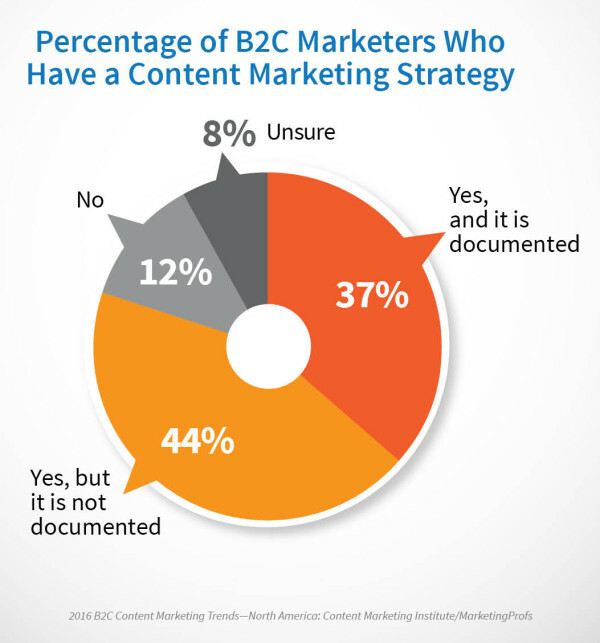 This year, we saw an increase in the percentage of B2C marketers who have a documented content marketing strategy (a proven key to improving content marketing effectiveness). While a lot of work remains to be done in this area, 37% of B2C marketers have a documented strategy – an almost 40% increase over last year, when 27% reported having one. In comparison, the percentage of B2B marketers who have a documented content marketing strategy decreased this year (32% vs. the 35% that reported having one in the 2015 version of our B2B research). Thirty-eight percent of B2C marketers say their organizations are effective at content marketing, vs. 30% of B2B marketers. As you’ll see in our full-length report, several factors help increase effectiveness, including having clarity on what a successful content marketing program looks like and having a documented editorial mission statement. Want more insights on what it takes to create effective B2C content? Find out what role engagement plays in the equation, and learn about a simple, four-step approach that will help you hit the mark. What do you think of the findings? How are they similar or different compared to what you’re seeing in your own company? Let us know in the comments. Over the coming weeks, CMI will be discussing these findings in more depth. To keep up to date, subscribe to our blog posts.